Civil Procedure Code, 1908, O.13 R.4-Endorsement of Document-Order 13 Rule 4 CPC only provides for a procedure for endorsement of the documents by the Presiding Judge, admitted in evidence-It is nowhere provided that if the Presiding Judge fails to endorse the document, the document cannot be read as part of the record. Comments Off on Civil Procedure Code, 1908, O.13 R.4-Endorsement of Document-Order 13 Rule 4 CPC only provides for a procedure for endorsement of the documents by the Presiding Judge, admitted in evidence-It is nowhere provided that if the Presiding Judge fails to endorse the document, the document cannot be read as part of the record. Civil Procedure Code, 1908, O.16 R.1–Production of Witnesses-Application under O.16 R.1-A CPC cannot be objected by the defendants—Filing of present revisions is delaying tactices; dismissed with costs. Comments Off on Civil Procedure Code, 1908, O.16 R.1–Production of Witnesses-Application under O.16 R.1-A CPC cannot be objected by the defendants—Filing of present revisions is delaying tactices; dismissed with costs. Closing of Evidence by order—Diet money but other expenses having been been deposited to summon the witness—Thereafter, it was the duty of the court to enforce the attendance of any witness through coercive methods. Comments Off on Closing of Evidence by order—Diet money but other expenses having been been deposited to summon the witness—Thereafter, it was the duty of the court to enforce the attendance of any witness through coercive methods. Evidence Act, 1872, S.34–Bahi Entry-When commission against himself proves his Accounts, which were maintained in routine by him then examination of clerk who had made entry is not necessary. Comments Off on Evidence Act, 1872, S.34–Bahi Entry-When commission against himself proves his Accounts, which were maintained in routine by him then examination of clerk who had made entry is not necessary. Defendant no-1 is suffering from various ailments and is an old lady of 80 years of age—She cannot travel a long distance from Bhopal to Chandigarh for examination—Direction issued to record cross examination through video conferencing. Comments Off on Defendant no-1 is suffering from various ailments and is an old lady of 80 years of age—She cannot travel a long distance from Bhopal to Chandigarh for examination—Direction issued to record cross examination through video conferencing. 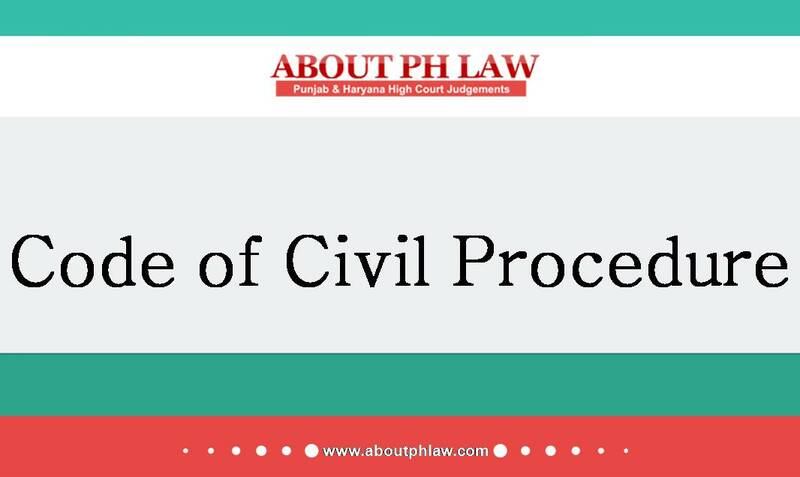 Civil Procedure Code, 1908,0.8 R.2–Additional facts-Supplementary affidavit-Held; When the cross examination has not been done, any additional fact can always be brought on file by way of supplementary affidavit. Comments Off on Civil Procedure Code, 1908,0.8 R.2–Additional facts-Supplementary affidavit-Held; When the cross examination has not been done, any additional fact can always be brought on file by way of supplementary affidavit. 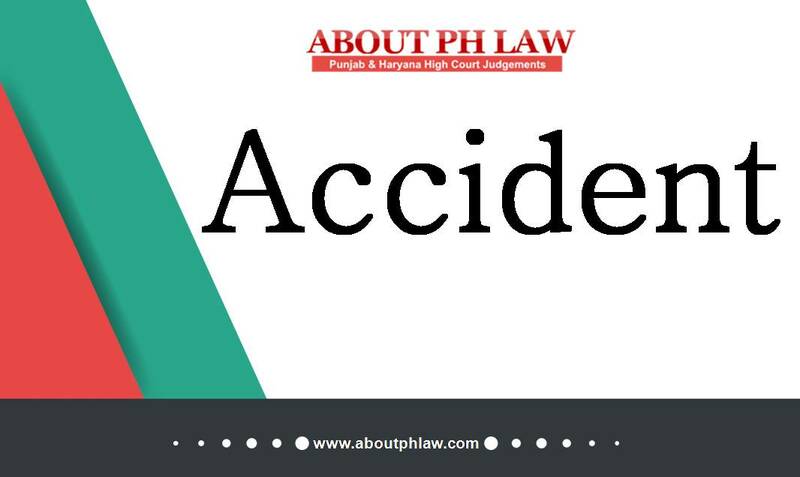 Accident—Claim petition—Even if the cases under the Act have been tried as summary cases yet the essential principle of the law of evidence cannot be given a go-bye. Accident—Loss of love and affection—Rs.50,000/- awarded towards loss of love and affection to unmarried sister. Comments Off on Accident—Claim petition—Even if the cases under the Act have been tried as summary cases yet the essential principle of the law of evidence cannot be given a go-bye. Accident—Loss of love and affection—Rs.50,000/- awarded towards loss of love and affection to unmarried sister. Withdrawal of suit—Liberty to file fresh suit—An application must disclose the technical defects in the pleadings which cannot be cured by any other means including the amendment application. Comments Off on Withdrawal of suit—Liberty to file fresh suit—An application must disclose the technical defects in the pleadings which cannot be cured by any other means including the amendment application. Closing of Evidence by order—To do justice, sometimes technicalities is to be ignored—One more effective opportunity granted. Comments Off on Closing of Evidence by order—To do justice, sometimes technicalities is to be ignored—One more effective opportunity granted. It is a settled principle of law that the plaintiff cannot be allowed to lead evidence in rebuttal in respect of an issue, the onus of which was on the plaintiff himself. Comments Off on It is a settled principle of law that the plaintiff cannot be allowed to lead evidence in rebuttal in respect of an issue, the onus of which was on the plaintiff himself. Comparison of Signatures—Photocopy of the document can be subjected to expert opinion. Rebuttal Evidence—Plaintiff has a right to lead evidence in rebuttal in respect of an issue, the onus of which was on the defendants. Comments Off on Comparison of Signatures—Photocopy of the document can be subjected to expert opinion. Rebuttal Evidence—Plaintiff has a right to lead evidence in rebuttal in respect of an issue, the onus of which was on the defendants. 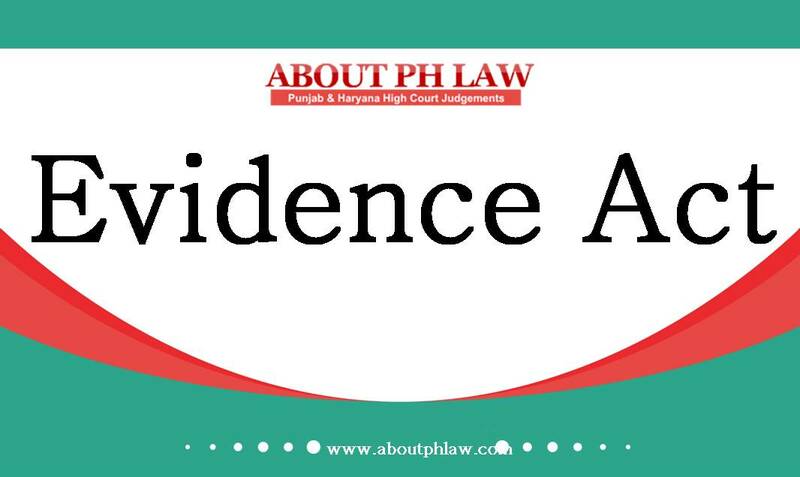 Additional Evidence—Cause of action accrued to plaintiff only after acceptance of application for secondary evidence by defendant—Plaintiff is entitled to lead additional evidence in this regard. Comments Off on Additional Evidence—Cause of action accrued to plaintiff only after acceptance of application for secondary evidence by defendant—Plaintiff is entitled to lead additional evidence in this regard. Recalling of Witness—This provision can only be invoked by the Court for its convenience and not on the asking of any party. Comments Off on Recalling of Witness—This provision can only be invoked by the Court for its convenience and not on the asking of any party. Compromise of Suit—Holding of an enquiry is must in case a compromise is asserted by one party and denied by other party. Comments Off on Compromise of Suit—Holding of an enquiry is must in case a compromise is asserted by one party and denied by other party.